Are you looking for that special someone? Does God have a perfect match already planned? If so, how can you find God’s ideal mate for you? Perhaps you have never been married. Or, maybe you lost your previous soul mate to death or divorce. Whatever your circumstances, if you have a desire to find the right person with whom you can share the rest of your life, then Soul Mates by God can help. 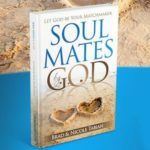 Soul Mates by God is designed to help you discover your best mate by following God’s way, and waiting for His ideal time. When you choose among options,how do you know what’s the best choice? For example, assume option “A” will make you very happy now but miserable forever after. However, option “B” is not immediately satisfying but will result in guaranteed happiness over the long haul. Which would you choose? Immediate gratification and then pay the piper. Or delayed gratification but then eternal bliss? Unfortunately the results for most of our choices aren’t so obvious. So usually we opt for whatever provides immediate satisfaction and hope we won’t live to regret it later. But God is never uncertain about the outcome of any decision. He is not bound by the chains of time or space. He is simultaneously present in every place and in all dimensions of time — past, present and future. He sees everything. He knows everything. He understands everything. He is never perplexed or confused. Because God loves you and is committed to your eternal well-being, He wants to guide your steps and choices so you can enjoy all the best that He has to offer. He knows whether being married is part of His ideal plan and purpose for you. And if it is, He also knows who will be the best soul mate. In fact, God will have specifically custom-designed and life-crafted that person just for you. However, He has given you the freedom to choose between His best and whatever other options you may pursue on your own. God knows who you will choose — whether His best or your alternative. But once you are married, there is no going back. In fact, because God knew everything you would do before you were ever born, He saw if you would choose His best or not. If you choose someone else, then God didn’t even bother to create His ideal mate for you. Why would He? He certainly wouldn’t want that person to miss out on His best for them just because you decided to go your own way. It’s not enough to just believe God wants to guide you to a custom-designed mate. In addition to placing your faith in Him, He also requires your devotion to Him as demonstrated through your obedience. To accomplish this God has given us His Word in written form so we can clearly understand His expectations, obtain an accurate perspective for reality, and appropriate the resources He offers us for this supernatural journey. The Bible is God’s road map to His best for you. His commands are the guardrails. His principles are the signposts. And His promises are the billboards describing the opportunities ahead . These are the spiritual truths and laws of the universe. Like physical laws, such as gravity, these spiritual laws can be ignored, but always to our peril. In addition to giving us the Bible, God has also placed Himself as the Holy Spirit within you. The Holy Spirit is there to guide you into all truth, to empower you to do God’s will, and to transform your character. God’s supreme objective for you is that you continually love Him more than any other person or thing. He wants to be the very center of your life — even after you have met the wonderful soul mate He has for you. God doesn’t want you to become so preoccupied with His wonderful gift that you ignore Him, the Gift-giver. So God is constantly at work to shape your priorities and develop your character. Our long range well-being is a higher priority to God than our immediate happiness. So He will withhold His planned blessings until we are mature enough to enjoy them appropriately. However, we often become impatient and try to achieve happiness through our own methods and means. As a result, we find ourselves stuck in a bad predicament experiencing the consequences of our foolishness and rebellion. But even then when we confess our sins and call out to God for help, He will come to our rescue. Though we may have messed up His ideal plan for us through disobedience, God can still bring much good out of our bad situation (Romans 8:28). If you choose to live your life using a natural human process, you will get a natural result. However, if you use God’s supernatural process, you will experience a supernatural result. But you can’t do both. Either you trust God and do life His way, or you rely on your own ingenuity and methods. Perhaps you are already trusting God for His best and following His directives but you still have not met your perfect match. You may be wondering what’s wrong? Why is nothing happening? Well something is happening. You just can’t see it. God is quietly at work. God’s fulfillment of our desire is seldom immediate. It was God who acknowledged it wasn’t good for Adam to be alone but then waited to create Eve. But first He had Adam go through the process of naming all the animals in the Garden of Eden. Why? He wanted Adam to fully realize his need and understand that apart from God intervening, the need would remain unmet. Then when the time was right, God brought Eve into Adam’s life. And when He did, Adam appreciated Eve and God all the more.